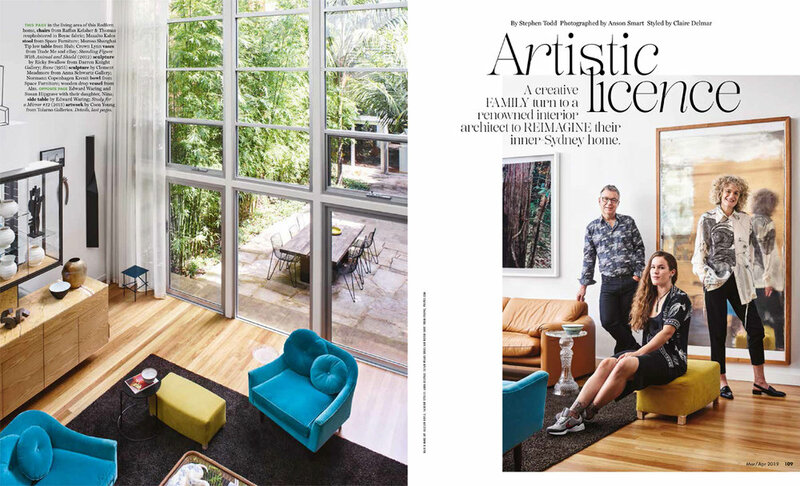 For a home already bursting with personality it was a pleasure for Studio Delmar to further layer the family home of artists Edward Waring, Susan Hipgrave and their daughter Nina for the multiple page Vogue Living article. Working with the redesigned home by late interior architect Brian Keirnan and a backdrop of the owners artworks, eclectic art collection and bold coloured furniture we played on the fun yet contemporary aesthetic. Modern furniture with vintage characteristics were brought in alongside a collection of organic and linear formed ceramics to compliment the architectural spaces. Adding to the creativity of the home a sculptural potted plant adds to the playfulness and ties in with Susan’s botanical ceramic drawings. Owner and artist Susan Hipgrave’s exhibition “It’s a Jungle Out There” is currently being held at the Arthouse Gallery. Article featured in Vogue Living Mar/Apr 19. Written by Stephen Todd. Photography by Smart Anson. Styling by Studio Delmar. Furniture – Hub Furniture, Space Furniture, Studio ALM, Living Edge. I’m a food and interior stylist and when I planned to start a blog, I was seeking a contemporary way to combine both my passions without the limitations that are intrinsic when styling for others. I also have a teaching background and have noticed the recent influx of interest in becoming a stylist through social media, Instagram and workshops. Because of that, I decided to share with you what I love and enjoy about my job and hopefully inspire you to entertain a little more in a simple yet special way. I also hope the blog can be used as a reference point or a resource upon which to build your own creative ideas. Throughout the coming months, I will use the blog as a vehicle to introduce not only the creative people that cross my path, but some of the behind-the-scenes information about what an interior and food stylist gets up to on a daily basis. I’m often bound by briefs, budgets and sometimes trends too, so I’m excited about the freedom of the blog and the ability to push my creativity. The kitchen is, and has always been, the most important place in my home and sitting around the table with friends, sharing a great meal is hard to beat. My most cherished memories are of conversations had whilst enjoying beautiful food in comfortable surroundings - so don’t expect too much overly-styled or matching table settings. What you will see is exactly how I love to live. I hope that by sharing my approach and ideas on the blog, you will have the courage and confidence to style your own homes and tables, bring together family and friends and also create simple but considered food and entertaining concepts within your home. I plan for the blog to lead me down an organic path and expect the ingredients and recipes to change as my garden and home elements (and props cupboard!) grow and adjust with the seasons. I love the unexpected and look forward to hearing your feedback and comments on how you like to entertain and spend time with friends and family because aren’t those special moments invaluable?